A P400 top in Greenhills can be bought for P100 in Taytay! You’ve probably heard of the Taytay Tiangge at least once before, and you’ve probably been told that it’s enormous and insanely affordable. Today I’m here to tell you that those are all accurate. I’ve watched countless YouTube hauls of amazing clothes from Taytay, and it’s about time you have that experience, too! What is the Taytay Tiangge? Taytay, Rizal is known as the Garments Capital of the Philippines and is home to the increasingly popular Taytay Tiangge. Thanks to an initiative by the local Taytay government in 2014, Taytay-based dressmakers who used to rent space in Baclaran, Divisoria, and Greenhills now have a more conducive business location right in their backyard. Since then, the Taytay Tiangge has become a shopper’s paradise and a godsend for wholesalers. One of our favorite things about Taytay is its unique schedule. While you can pretty much visit during normal business hours (6 a.m.-5 p.m. every day), the real magic happens from 6 p.m. on Mondays until 10 a.m. the next day, and 6 p.m. on Thursdays until 10 a.m. the following morning. It’s the perfect time to shop because this is when the stocks have just dropped, and you’re first in line to the best items. If you can get there early enough, you might even get ahead of wholesalers! Believe it or not, some stalls are emptied before 5 a.m., so you better get moving! The good thing about Taytay’s odd schedule is that it gets you in and out of the market before Manila traffic even begins. If you leave Makati at 2:30 a.m., you can find yourself in the area by 3 a.m. Just make sure you’ve had your coffee! If you’re driving to the Taytay Tiangge, you can easily find it by searching for Club Manila East on Google Maps or Waze. You won’t miss it because it’s a huge patch of land filled with tents and is buzzing with shoppers and vendors alike. There’s a parking space right across the market too, so you’ll have no problem with your car. If you’re taking public transportation, it’s still accessible. From Quiapo, you can take a bus, jeep, or UV Express to Taytay. From Cubao, you can take a jeep or UV Express to Angono/Binangonan. From Commonwealth, take a jeep or UV Express to Sta. Lucia, and then a jeep to Taytay/Angono/Binangonan. Ask to be dropped off at Taytay Tiangge or Bagong Palengke, and you’ll be there in no time! Ready-to-wear clothes are the heart of the Taytay Tiangge. They have everything— from the latest trends in women’s fashion, children’s pantulog and men’s sportswear. 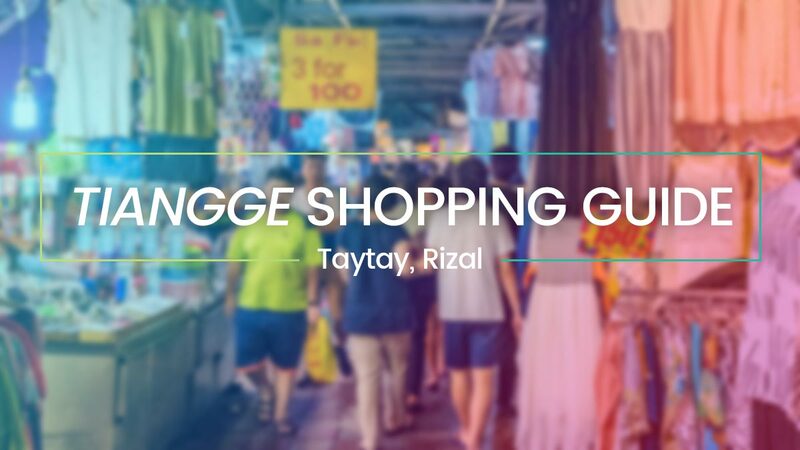 Items you see in online shops are usually available in Taytay too, and you’ll be amazed to see that Greenhills and Divisoria clothes are sold here for less. You can also find high-quality overruns for very low prices. While most items in Taytay are “free size,” or in reality, made to fit small to medium frames, there is still a good selection for other body types. Youtube vlogger Helen On Fleek shared her haul of plus size-friendly Taytay goods here, in case you’re curious! Tops can be bought for as low as P40-P100 apiece. Skirts and shorts are roughly the same range. Overruns can be worth as much as P300, while denims are more or less the same. Depending on the quality and design, which shouldn’t be hard to judge, prices may vary. What we can guarantee, though, is that they are ~*much*~ cheaper than items sold in Divisoria, Baclaran or Greenhills. A P400 top in Greenhills can be bought for P100 in Taytay—can you believe that?! Case in point: here’s what I got for under P1000 in a single trip to Taytay. We sent our Cam Crew girls Chase and Angela to Taytay Tiangge and gave them P1,500 each to shop for three outfits. Check out what they bought! Taytay Tiangge: Is It Worth The Hype? 1. Bring your own eco-bag. Expect to spend little, but shop A LOT. Your own shopping bag means less plastic bags from vendors, and a more eco-friendly shopping experience! 2. Bring lots of change and small bills. Remember the good old saying “barya lang po sa umaga?” That’s also true for the wee hours of the night, when vendors are half-asleep and so are you. 3. Bring friends with you. You can get wholesale prices for 3-piece purchases, so having friends with the same taste and style will definitely help you save money! That P10 discount goes a long way, especially when you’re on your 23rd item of clothing. 4. Always check your items before leaving the stall. Check for stains, unfinished hems, and other sewing mistakes. While you can get really great items from Taytay, remember that these clothes don’t go through the same quality assessment as most branded products do. You might be tempted to panic-buy with all the low prices, but it really pays to have a sharp eye! For more info, visit the Taytay Tiangge Facebook Page.